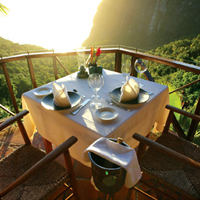 In St. Lucia the place to dine in is the Dasheene. The Caribbean influences not just the food but the ambience and service. Located at the Ladera Resort is simply the best International Restaurant on the Island. The Dasheen is nestled in a picturesque setting on a hillside over looking the majestic Pitons, lush mountain ranges and the Caribbean Sea.